ABUJA, NIGERIA (PREMIUM TIMES) -- The Nigerian government has been advised to increase its investment in the agricultural sector so as to make it a steady and alternative means of revenue generation for the country. 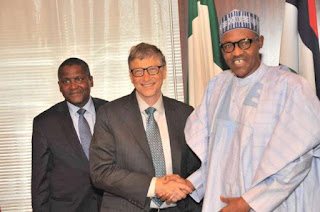 Bill Gates gave this advice at the special session of the National Economic Council meeting focused on human capital development held Thursday at the Banquet hall, Presidential villa, Abuja. Present at the meeting were the Vice President, Yemi Osinbajo, who is the chairman of NEC, some governors, ministers, CBN governor, Aliko Dangote, Bill Gates and other development partners. Mr. Gates in his speech said the government should shift attention from oil and improve the agricultural sector to becoming the pillar of Nigerian’s economy. According to him, only four per cent of Nigerian farmers currently have loans to grow their business and this is unacceptable especially in a country where the sector accounted for a large proportion of the country’s GDP, and during the oil price collapse and recession, helped cushion the economy. He however lamented that the sector is not growing as it ought to and many small scale farmers still lack access to loans that can assist with the expansion of their businesses. Mr. Gates said the sector still has a lot of potential to grow but pointed out that what is hindering the growth is that majority of Nigerian smallholder farmers lack access to the seeds, fertilizer and training they need to be more productive. “… Healthy people need opportunities to thrive and one of the most important of these opportunities is agriculture, the sector that nourishes Nigerians and supports half the population especially the poorest,” he said. Mr. Gates said lack of access to finance is one of the barriers that continues to prevent smallholders from thriving. “Where three quarters of people have mobile phones, digital financial services can offer the potential to boost the economy from top to bottom. Right now more than 50 million Nigerian adults are at the whim of chance and the informal economy. With access to digital financial tools, they can cope better with disaster that threatens to wipe them out, build assets and a credit history and gradually lift themselves out of poverty,” he said. Mr. Gates urged the government to consider the impact this would have on businesses. He said of the 37 million micro, small and medium enterprises in Nigeria, more than 99 per cent are micro and their lack of access to finance is a leading reason why their businesses cannot grow. He said estimates reveals that digital financial services will create a 12.4 per cent increase in Nigeria’s GDP by 2025. Meanwhile, oil accounts for about 10 per cent of Nigeria’s GDP. He commended the government for “some effort to fill these gaps”, with more investment and series of smart policies to encourage private sector investment. He urged the government to do more because “these reforms lay the foundation for a booming agricultural sector that feeds the country, helps end chronic malnutrition and lift up tens of millions of smallholder farmers”. The Vice President, in his remark said not only is the government aware of these issues raised, but it is prepared to take the challenges outlined head-on. Mr. Osinbajo said the government in 2016 launched a Social Investment Programme comprising a job scheme for unemployed graduates, a feeding programme for public primary schools, a micro-credit scheme for small businesses and a cash transfer scheme for the poorest and most vulnerable households. Highlighting the successes of some of the programmes, Mr. Osinbajo said the school feeding programme currently serves over 7 million school children across 22 states. Mr Osinbajo also said the N-power programme has also engaged 200,000 young Nigerians and will be scaled up to 500,000 this year. He said the government is leveraging on the creativity and innovation of the young people to grow the healthcare and education sector.